Odisha is famous for its religion-spirituality. These are known as Parbas. In Odisha people celebrate 13 parbas in 12 months. Odisha is famous for its festivals. Odisha is known for her colorful festivals. The festivals are numerous, spread over all the twelve months of a year. The village life centers round agriculture. So there is an intimate relationship of festivals with the agricultural operations. Odishan Festivals are also observed as part of Hindu religious faith. Dates for Odishan festivals are determined by the traditional Hindu calendar. The specialties of most of the Odishan festivals are that, on these occasions, much merry­making is done, new clothes are worn and special dishes are prepared at home. The Odishan cuisine is at its test in these functions. Delicious dishes prepared include small cakes known as Pitha and also sweets made from milk. Festivals carry forward people’s tradition and culture. Makar Sankranti is celebrated in the month of January. By this time, harvest of new paddy is over. On this day people offer food to God. Dhanu Yatra is a famous festival of Western Orissa, especially at Bargarh town. In Dhanu Yatra people play the episodes of visit of God Krishna to Mathura. Dola Purnima is very popular festival in the Odisha. Radha and Krishna are the main deities who are worshipped in this Festival. The main attraction of Dola Yatra is Holi, the festival of colors. Maha Shiva Ratri is the festival dedicated to Lord Shiva. On this day, devotees keep fast and perform Puja in the ‘Shiva’ temples. Pana Sankranti is the beginning of New Year in Orissa. On this day also ends the fire walking function called `Jhamu Yatra’ where penitents walk on live charcoal to the accompaniment of gongs and drums. Raja is the festival to give honor to the Mother Earth. This festival is celebrated for three days. During the festival special delicious foods are prepared in every home. Girls wear new clothes and make a lot of merry-making in Swings. 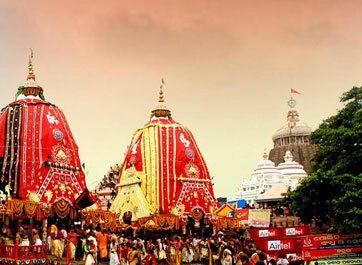 Ratha Yatra is the grandest festival in Odisha. On this festival Lord Jagannath with brother Balabhadra and sister Subhadra take a journey in wooden chariots from main Jagannath temple through the streets to Gundhicha Ghar, where the deities stay for nine days. Durga Puja is a festival symbolizes the commemoration of victory of good over evil. Goddess Durga is worshipped from the Seventh to Tenth day at the mandapas. On the Tenth day, a procession is carried out toward a river for immersion of the idol. Nuakhai is a major social festival of Western Orissa. On this day new rice is cooked with milk and sugar and distributed. Sitala Sasthi is the celebration of marriage ceremony of Lord Siva with Goddess Parvati and is mostly observed in Western Orissa particularly at Sambalpur in June. Copyright © 2019, Odisha Tourisms. All rights reserved.